You’re here either because you bought an electric scooter or you are looking to make a purchase and are now wondering if they are street legal? Unfortunately, there are no YES or NO answers to your question. Mainly because electric scooters are the future of transportation and the future of legislation has yet to arrive. However, in most countries and jurisdictions, electric scooters are generally treated just like ordinary bicycles. Typically, they require no operational licenses, are not taxed, incur no parking fees, and can be carried on to most public means of transportation. The specifics may vary in the details but in nearly all jurisdictions, so long as the electric scooter has met the legal road use requirements, they are considered street legal, with the exception of New York. This can include having a suspension system, the right tires, a rearview mirror, a horn, headlights, signal lights, brake lights, and power steering. It all depends on where you live and use your scooter. Many countries may also require that the electric scooter rider wear a helmet. Because electric scooters will rarely fall under the classification of full motor vehicles, it’s unusual that laws will require any type of operating license or form of registration. However, countries and even states do have their unique laws and regulations governing the use of electric vehicles. Therefore, it is not possible to find one electric scooter that can be termed as street legal in all countries or locations. Generally, these laws revolve around top speeds, how powerful motors the scooter can have and where they can be operated. In most countries and states these scooters can not only be operated by adults but also utilized by children. The below rules are just a scratch on the surface and should not be considered as legal advice of any sort. I have not read all there is to know about the laws and legislation of electric scooters and each country and state have their own restrictions. So I urge you to check with your local motor vehicles department or the equivalent after reading through our summary. Do you need a license to ride electric scooters? A driver’s license, registration, or insurance is not needed in order to ride an electric scooter. However, there are laws that restrict where you can use them and the amount of power (read Wattage) the motors can have. Electric scooters are often prohibited on sidewalks. You may use it on public roads where the speed limit is no greater than 25 mph, and on roads above by using the bike lane. Do riders need to use a helmet? Some countries have laws that prohibit users to ride without a helmet. Some have for kids below age 15 but most commonly there are no laws that say you need to wear a helmet to ride. What is the best suitable models? If you’re looking to buy a brand new electric scooter we suggest that you have a look at our assorted list of the top performing models here. In the US, it can get quite confusing when it comes to understanding what constitutes a street legal electric scooter and what does not. This is because the US federal law governing electric bikes is normally applied to electric scooters as well. 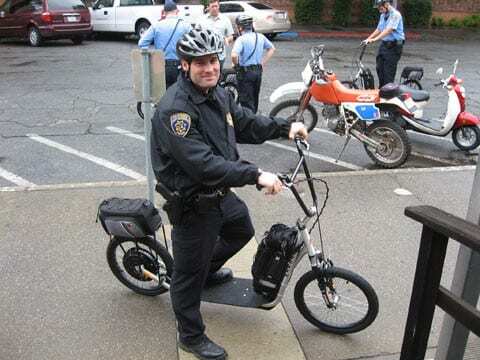 The US2002 Federal Law stipulates that an electric bike will be classified as street legal if it has a top speed of less than 20 mph and a motor power below 750W. If yours falls within this range, it will not require registration or a license in most US states. Electric scooters in the US are allowed on roads that lack bicycle lanes so long as they don’t exceed the speed limit of 25 mph. Unless you are passing or turning left, the scooter has to be ridden close to the curb on your right hand. Different US states have individual specifications when it comes to e-bikes or what are known as Personal Light Electric Vehicles (PLEVs). California, for instance, is now accepting Personal Light Electric Vehicles (PLEVs) on cycle lanes, pavements, and roads, so long as the rider is wearing a helmet and is over 16 years of age. On the other hand, the City of New York banned electric scooters usage back in 2004 and riding a PLEV in this City will land the rider a fine of $500. In San Francisco, it is unlawful under Section 7.2.111 of California Transportation Code to park or leave unattended powered scooters in some areas without a Municipal Transportation Agency permit. Generally, in Canada, electric scooters and bikes are legal. Referred to as power assisted vehicles, e-bikes, e-scooters or electric scooters, the laws governing their usage and ownership are very similar to those of traditional bicycles. They generally require no plates, license, or insurance to operate in Canada. Motorized scooters and bicycles fall under Canadian federal law but each province is free to make small adjustments like age requirements. Individual municipalities can make minor changes in regard to where riders can use them. In the UK, riding an electric bike is legal so long as it meets specific requirements and you are at least 14. Referred to as Electrically Assisted Pedal Cycles, you don’t need a license to own or ride one. You also don’t need to register or insure the EAPC nor are you taxed. Weirdly, although lots of e-bikes are generally legal in the United Kingdom, electric scooters are not so lucky. Here, electric scooters are classified under Personal Light Electric Vehicles. While not subject to taxation or registration requirements, they are not legal to use in public and are restricted to use on private land. As they are motorized and many don’t have pedals, it is illegal to use electric scooters on pavements and cycle lanes. Additionally, being low-powered, it is illegal to use them on the road. However, having noted that, if you ride an electric scooter responsibly and show respect to pedestrians as well as to other road users, you are very unlikely to be stopped by the UK traffic police. In other EU countries, the rules and regulations governing electric bikes come under the general purview of Regulation 168/2013. In France, for example, a Personal Light Electric Vehicle (PLEV) is allowed to attain up to 25 km/hour when on a cycle lane, while in Switzerland and Austria this rule is extended to road use. In Germany, a PLEV is allowed to attain 6km/hour when being ridden on the pavement. There are models for young children and kids under age 15 needs to wear a helmet in most European Union countries. I am proud to say that my country Sweden offers 25% of the electric vehicle purchase back in tax. If you are planning on acquiring an electric scooter, then I highly recommended that you familiarize yourself with the laws and regulations governing their usage in your local area. It would be a total loss if you went ahead and bought one only to discover that your city restricts where you use it. Remember to check the maximum allowed wattage and top speed in your state or country since those are the most regulated. The best place to begin will be your local motor vehicles department or the equivalent. I also recommend that you read the manual so that you know what it takes to operate your vehicle safely. For more in-depth knowledge you can also check out our guide on how an electric scooter work. 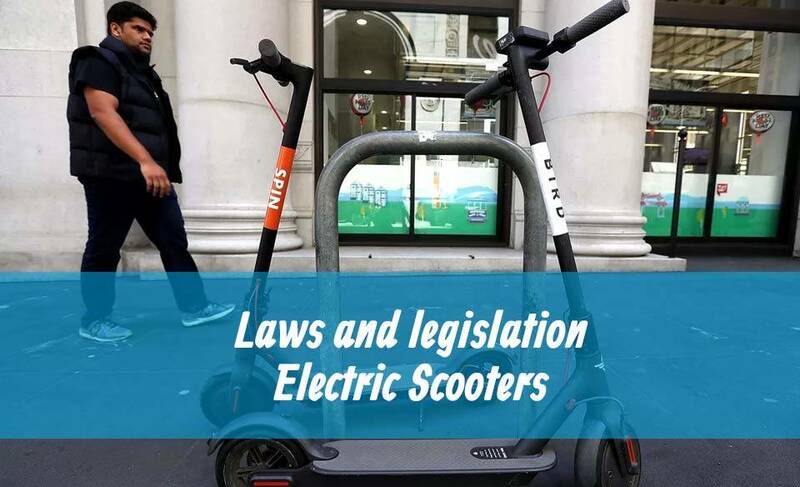 The fact is that laws and regulations for electric scooters are constantly evolving and as more people adopt this mode of urban transportation, you can also expect countries and jurisdictions to enact more specific legislation. Make sure you stay up to date with any new laws pushed through. I bet my right hand we will see much harder legislation on electric vehicles in the coming years due to all the dockless scooter rental companies.